According to BET, their nominations were selected by BET's Voting Academy, which comprised of fans and entertainment professionals in the fields of television, film, music, social media, digital marketing, sports journalism, public relations, and the creative arts. Nigeria's Wizkid and Yemi Alade, South Africa's AKA and The Soil, Ghana's Sarkodie and Stonebwoy, DRC's Fally Ipupa alongside Kenya's Sauti Sol have been nominated for the Best International Act in Africa. 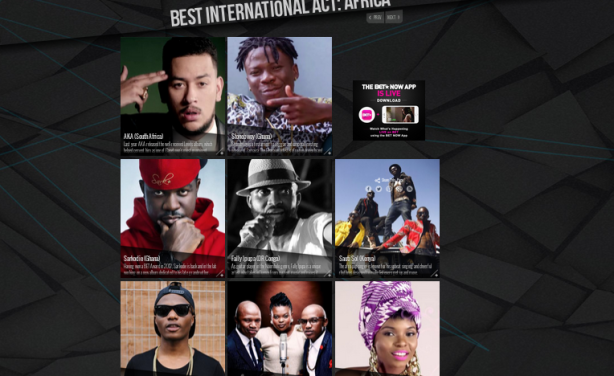 This year's edition of the award which will hold Tuesday, June 30 saw the addition of a new category, Bet Global Good Award with Tanzania's Millen Magese as the only nominee.